Details: Winter is here and we are featuring our favorite winter reds in a five course wine dinner hosted by Denny Klein, Wine Importer and Expert. We picked wines from all over for this dinner. 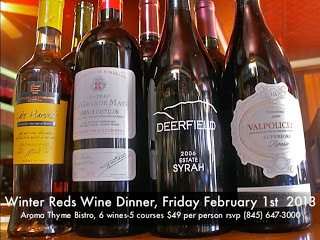 Warm up to Winter Reds at Aroma Thyme, $49 per person. RSVP (845) 647-3000.